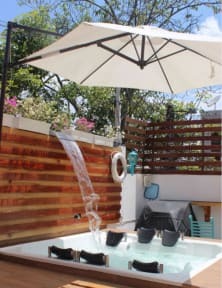 We have a nice terrace with some features as a hot tub, bar, barbecue, comfortable tables and chairs. We also have computers for you to use whith free internet access and free Wi-Fi. Board games are also available. We have a fully equipped kitchen to prepare your favourite meals! 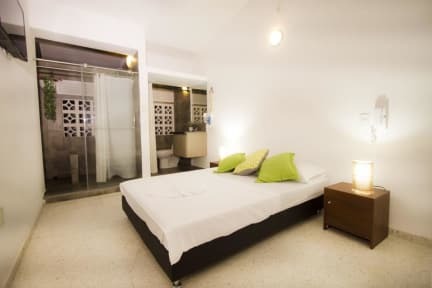 We have 6 bedrooms; 3 privates rooms and 3 dormitories which can accommodate from 5 to 8 people. We are located in Cabecera del Llano, the epicentre of shopping and nightlife of Bucaramanga. However. our location is perfect to rest, you won't hear any noise. The property is few meters far from bus stations with routes that takes you to the main places of the city. We are placed in a fairly quiet street but a few meters from bars, restaurants and shopping centres. Have 3 privates rooms with TV, hot water, and air conditioning or a modern ceiling fan. Our 3 dormitories include bunk beds, reading lights and plugs in each bed to charge your phone. We provide private or shared bathrooms. Payment upon arrival by cash, credit cards, debit cards. This property may pre-authorise your card before arrival. Check out before 12:00 PM. This place is awesome they are so sweet, the breakfast was good, the atmosphere was wonderful stay here fosho!! Great location, amazing friendly staff with great amenities! I highly recommend it and would stay here again. Really great spot. We only booked one night as a stop on the way to San Gil but immediately wished we had stayed longer. Good a/c, netflix on the TV in our room, and HOT water in the shower! Went out for breakfast so not sure if the breakfast served is good, but the coffee was. Great place, would recommend. Great location. Staff is super friendly, but you do need to have a simple grasp of Spanish to get by here. I really enjoyed the atmosphere here. Excellent facilities, located in Cabecera, a pretty good neighbourhood to get everything you need: restaurants, bars, shops, transport. The staff is really helpful and will make their best to guide you but you should check schedules and times by yourself because they might drop the ball on that. Nice hostel in a good area. Nice staff. Decent hostel, has everything you need. Could change breakfast hours though as it starts and finishes too early. A nice place to stay. I had the room to myself on a Friday night. Beds are a bit hard but the staff is very sweet.